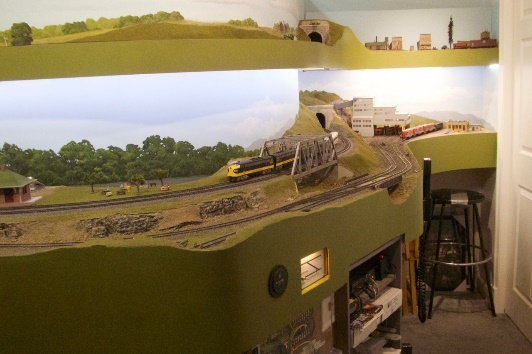 Mike’s Layout is a 14 x 18.5 ft. double deck layout with 130 feet of mainline track on the bottom deck, and about the same on the upper deck and 99 feet of track in the beautifully designed helix by Gary Brooks. All bench work is completed and all the code 83 track is laid and some scenery work is done. The layout is designed for both operation and running trains. Time frame is late 1960’s through 1983. DCC control is by NCE. Cameras are allowed. For more detailed information on Mike’s railroad click here.